An indigenous community reconnects with its heritage by working to end hunting and promote bear-watching in British Columbia’s Great Bear Rainforest. 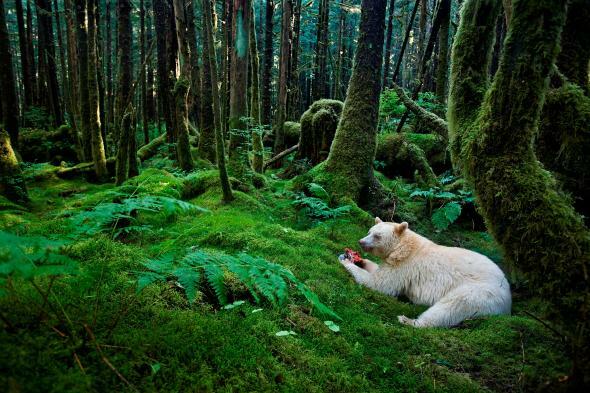 There are stories about the white bears that hide in the deep forest of British Columbia’s coast. Old stories, handed down from one generation to the next for thousands of years, since the last Ice Age gripped the world, and glaciers licked the edge of the rain forest. One tale, told by the Kitasoo/Xai’Xais Nation, says that as the sheets of ice began to retreat, Raven—the creator of all things—made the animal known as the spirit bear to remind him of the ice and snow. 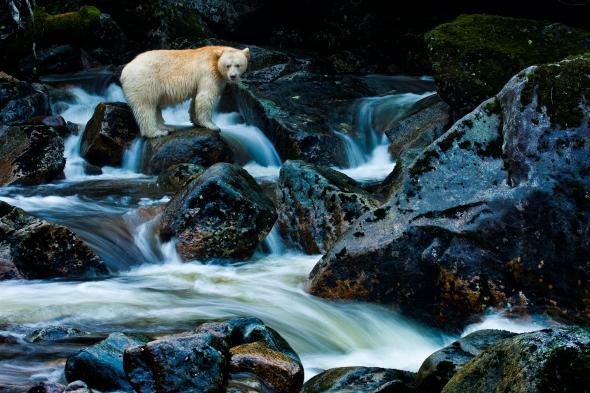 It’s a story that speaks not only to First Nations’ connection with wildlife but also to their deep roots in the Great Bear Rainforest, an area the size of Switzerland that’s home to some 20,000 First Nations people. Yet in the 1980s when Doug Neasloss, the elected chief of the Kitasoo/Xai’Xais, was growing up, he never heard the origin story of the spirit bear. In fact he never heard of spirit bears at all because for decades the stories about these white-coated relatives of black bears were kept secret. Elders feared that if word of their existence spread, spirit bears—like black and grizzly bears—would be pursued and killed by fur trappers or trophy hunters. So in the late 1990s when Neasloss was starting to work as a wildlife guide and his boss told him to go out and look for a white bear, he was skeptical. You guys are out to lunch, he remembers thinking—there’s no such thing as a white bear. But Neasloss dutifully ventured into the bush. He was just unzipping his trousers to relieve himself when a ghostly bear padded into the forest and lay down on a bed of moss 30 feet in front of him. The bear began gnawing on a salmon it had caught in a nearby stream, unconcerned by Neasloss’s presence. A ray of sun momentarily broke through the clouds. “It was magical,” he says. Spirit bears, also known as Kermode bears, are among the world’s rarest ursines, found only in the remote archipelago of British Columbia’s central coast. 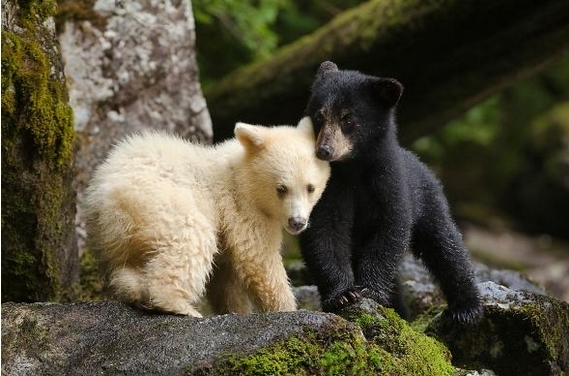 They’re a subspecies of the black bear, born white when two dark-furred parents carry an obscure genetic mutation. 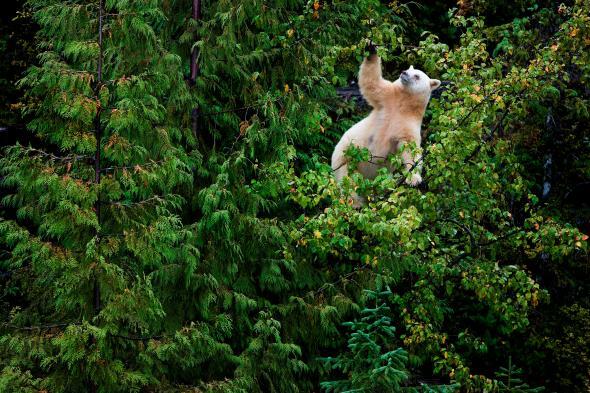 The British Columbian government estimates there are 400 spirit bears in the province, and hunting them is illegal. Today, First Nations up and down the coast are reclaiming their culture, and bear-based ecotourism is a part of that. Many tribes are rebuilding the “big houses” where potlatches and other ceremonies are held, sometimes with money earned from tourist operations. Coastal Guardian Watchmen are reconnecting with their traditional lands as they patrol for illegal hunting. And elders no longer fearful of poaching are starting to share the sacred stories about bears they’d kept silent for so long. Just down a gravel road from the Spirit Bear Lodge is Klemtu’s big house, a massive cedar building constructed in 2001. It’s perched at the edge of the sea, surrounded by mist-shrouded cedars and spruce trees, with an opening in the roof to let out wood smoke. Inside, 24-year-old Barry Edgar is giving a tour. He talks about a new online database that’s preserving digital recordings of traditional stories and about the new generation of children who will grow up hearing ancient tales about Kitasoo/Xai’Xais’ unique relationship with bears, told beneath the carved totem poles of the big house. Responses to "First Nations Fight to Protect the Rare Spirit Bear from Hunters"
Inspiring, wonderful - you have made my day! Reason to go to British Columbia just to celebrate this the First Nations' reconnection with their heritage and spirit animals..